This is the book I was so pleased to find in a Harrogate branch of Oxfam. 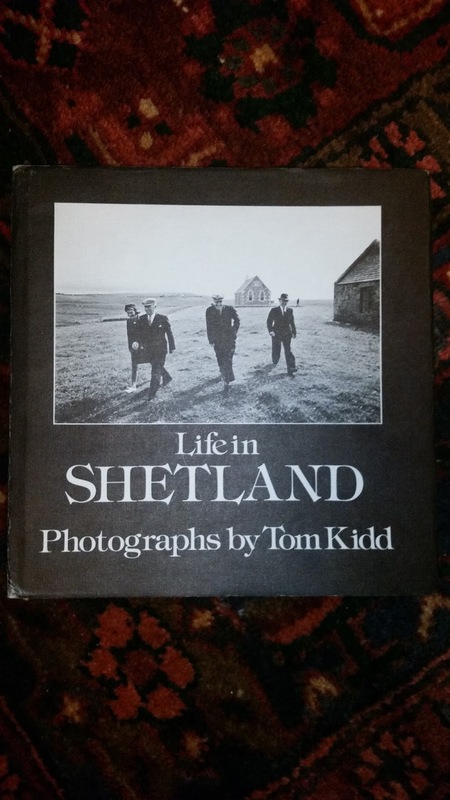 Tom Kidd's photographs date from the mid to late 1970's, the time when the oil industry was really beginning to make an impact in Shetland. It's also the Shetland, or at least one view of it, that I knew as a very young child (bits of it anyway). It's a remarkable document of a point in the islands history - it's something to be grateful for that someone was on hand with the specific intention of documenting it - which makes it a welcome addition to my small Shetland bookshelf (it also means I'll no longer be tempted to pinch my fathers copy). I'm just back from a very satisfactory weekend away, slightly dismayed by the number of things I have to do before work tomorrow, but determined to share the highlights anyway. Theoretically the best thing about living in the midlands is the number of interesting places that really aren't that far away. In practice this seems to boil down to making regular comments along the lines of 'we should really go to Harrogate' and then never doing it. Except this time we finally did. the thing with Harrogate is that people always say it's lovely, we regularly pass the signs on the way to and from Scotland, and neither of us had ever been. We also looked at a serious amount of ecclesiastical architecture. Rievaulx abbey, which is haunting, has a grace and beauty about it, it also has an excellent little museum with some extremely powerful remaims of carved heads (they're quite coarse and primitive compared to much of what I've seen, but they have real presence - more than enough to put the fear of God into you) and little odds and ends which make the destruction that accompanied the dissolution of the monasteries suddenly starkly real. They also have a very good tea shop that does extremely generous slices of very good cake. 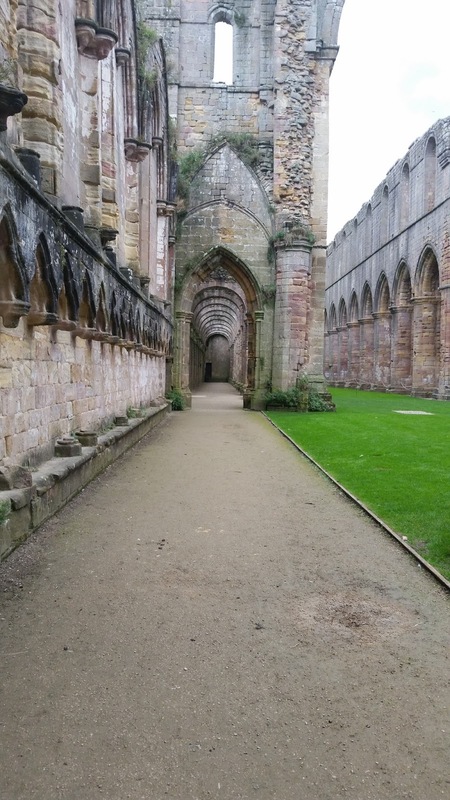 After Rievaulx, which I'd thought was pretty impressive size wise, we went to Fountains abbey (National Trust rather than English Heritage, soulless tea shop, disappointing cake). I was momentarily distracted by a herd of giant Schnauzers (7 of them, they were really nice dogs) and then floored by the size of the place. It's the most effective demonstration I've ever had of what the power and wealth of the church meant in this country pre reformation. The site looks like it could be the ruins of a reasonable sized town rather than a single institution. It really deserved a whole day rather than the couple of hours we had, and I can't say often enough just how huge it is. I mean really big. 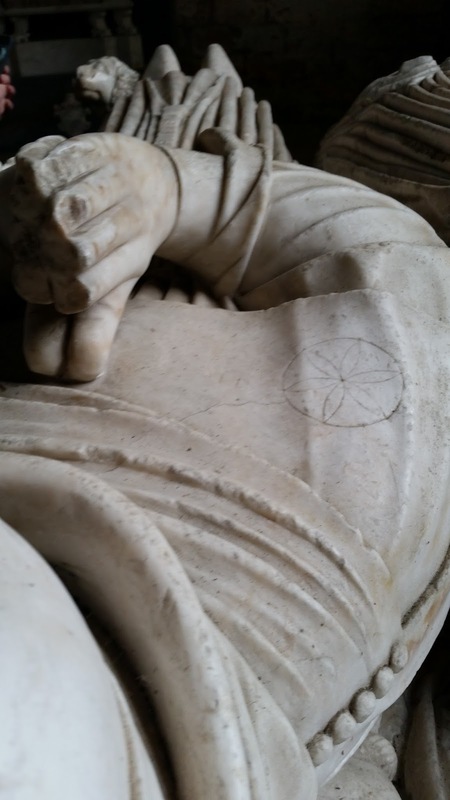 There was also the nearby church at Studley Royal to look at which is a mad Victorian confection with some glorious details, and on the way home Harewood house and the impressive collection of alabaster effigies in All Saints church there, including one that's had a witch mark carved on it. There's the start of a great story in that. More than that I managed to realise a long cherished ambition (details soon) and found a hitherto elusive book, so altogether a very satisfactory weekend indeed. Over the last couple of weeks I've got 3 new cookbooks, Diana Henry's 'Simple', Gill Meller's 'Gather', and Patience Gray's 'Honey From a Weed'. I've not read much of 'Honey From a Weed' yet, but on the first page Gray (who is a wonderful writer) talks about how "Good cooking is the result of a balance struck between frugality and liberality..." Something which "is born out in communities where the supply of food is conditioned by the seasons." 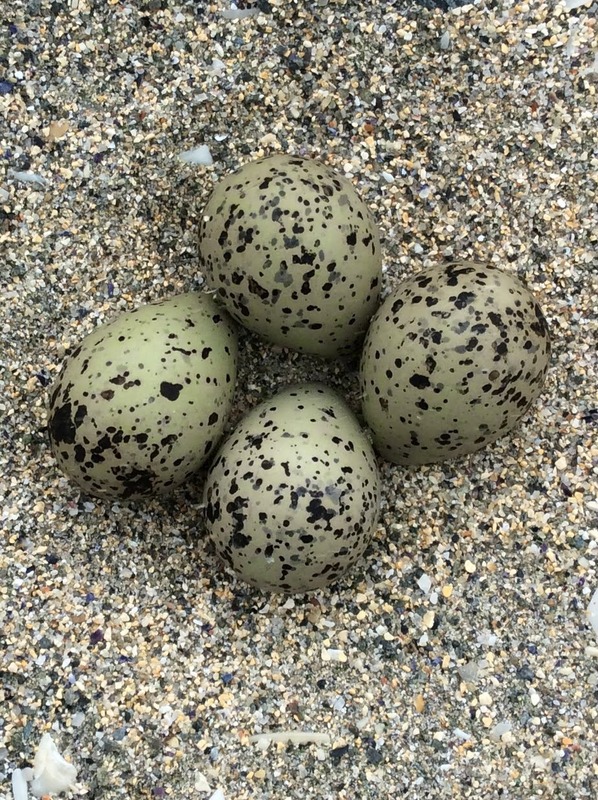 And that "Once we lose touch with the spendthrift aspect of nature's provisions epitomised in the raising of a crop, we are in danger of losing touch with life itself." She wrote that in 1986 at a time when I guess we were really beginning to take ingredients, and their year round availability on supermarket shelves, for granted. Thirty years later we still seem inclined to lose touch with the realities of crops and seasons - which is not encouraging. Anyway, it was with those few sentences very much at the front of my mind that I opened 'Gather', which only increased its impact. It's a book I've been anticipating for months (I follow Gill Meller on Instagram where there's been a tantalising stream of pictures suggesting something pretty special was on the way. There was.) Meller is the head chef at River Cottage which was already a pretty good indication of the kind of quality to expect. I'm a River cottage fan for all sorts of reasons, not the least of which is the growing number of really inspiring writers and cooks who have been part of that project. Put their books together and there's a real sense of dialogue between them, which is the sort of thing I get excited by, and has added to the anticipation with this book - what would it bring to the conversation? Well, Diana Henry (who knows what she's talking about) says "Gather is a perfect expression of something food writers have been trying to define for the past three decades - modern British cooking." I think she's right, this is a book rooted specifically in the landscape of Devon and Dorset, it's food that respects where it comes from, which certainly strikes that balance between frugality and liberality, and which just feels right. 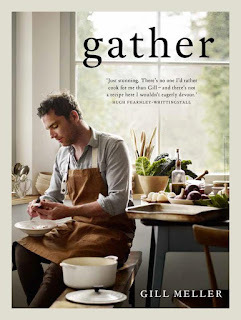 Meller starts with a definition of what gather means (To collect from different places; assemble | To cause to come together; convene | To draw (something or someone) closer to oneself | To harvest or pick) - which explains why it's become a philosophy to him in the way he cooks and eats. I can't help but agree with it, it so neatly covers what I enjoy most about cooking. The chapters cover different parts of the landscape (farm, orchard, moor, seashore, field, harbour, garden, and woodland) which give plenty of opportunity to think more about where our food comes from (I can't tell you how much this makes me miss living by the sea, and having a garden). 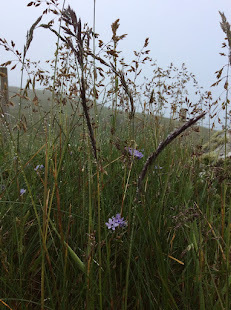 Looking at a recipe for beef shin with smoked dulse (which is making my mouth water) the links between landscape and food are enough to conjur a vision of cows on the beach back home. I also love the way that recipes go from fairly traditional - something like fried pheasant with quince and bay, to more unexpected combinations such as trout cured with rhubarb and rose petals (it's the same principle as gravadlax, but sounds somewhat more romantic), or a salad of raw beetroots, curd, and rose. I can already vouch for the chocolate rye brownies and how the crisp sugary nutty topping (and in my case myrtle leaves) transform them from fudgey treat into something both earthy and elegant. The recipe that's really made me fall in love with this book though is for oat plum breakfast cake - it has something a bit like a flapjack for a base, a layer of cream and cream cheese, and plums fried in honey and butter on top. How could I not fall for that? Or for someone who suggests it for breakfast (there's more liberality than frugality in this particular recipe, and doesn't it sound good). I hope I've managed to share my enthusiasm for this book, it feels like an important one, a milestone on the way to a better understanding of food and landscape, and something to shout about from the rooftops. I've got a copy of Gill Meller's 'Gather' and I'm really very excited by it, I'll write more about it in the next few days, but I'm going to start with his chocolate and rye brownies because I've just made some and they're great, which is quite a big thing for someone who's been loyal to the same Nigella recipe for the last 16 years. I've not been baking much of late so I've got cupboards full of things quietly passing their best before dates, which is annoying and wasteful, the brownie recipe was to good a chance to miss of using up a packet of rye flour (I keep buying it with the intention of getting a rye sourdough starter going, never quite get round to it, and then throw half the packet away because it so often seems to worthy to be tempting) and some nuts which are far to expensive to be allowed past their best before. The promise was that rye and chocolate are a match made in heaven, with the nutty notes in the flour really bringing something to the mix. The end result is indeed satisfyingly nutty, not worthy at all, and this is a base I'm now really looking forward to playing with. 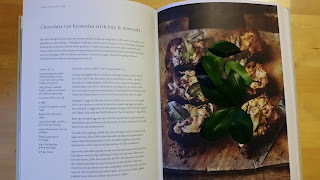 The actual recipe is for chocolate rye brownies with bay and almonds. I had myrtle (which really loves growing on a windowsill, has the most fantastic orangey scent to it, and is, for me, quite an acceptable bay substitute) and hazelnuts, which I should have toasted first. It also asks you to reserve half an egg white which goes into making a crunchy, sugary, topping which I thought might be slightly more trouble than it turned out to be. So. Prepare a baking tin (about 20 x 30cm), and melt 200g of good quality dark chocolate with 180g of unsalted butter and a pinch of salt (it should probably be done in a bowl over water). Separate 1 egg and put half of the white to one side. The rest of the egg plus 3 more can go in a bowl with 100g of golden caster sugar, and 80g of soft brown sugar and beaten until light and fluffy. Turn the oven to 160 degrees C/ gas 3, and beat the half egg white until it's light and airy, add a pinch of salt, 100g of nuts, the finely grated zest of half an orange, and 50g of Demerara sugar. Mix until the nuts are well coated and the mix is properly combined, put to one side for a moment. Now beat the eggs and sugar into the slightly cooled chocolate mix, add 150g of rye flour, mix thoroughly, then pour into the tin. Take the egg and nuts mix and spread evenly on top, and dot 6-8 myrtle/bay leaves into the batter (push the base of each leaf into the mix). Bake for 25-30 mins, until cracked and firm on top. Allow to cool properly before eating. 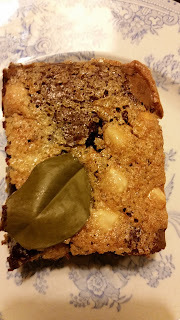 I love the crunchy topping - the orange flavours from both rind and myrtle are lovely, and the change in texture from crispy to gooey is great, but I'm also keen to try these topped with marmalade and have a feeling that when I do I'll have found my personal brownie nirvana. 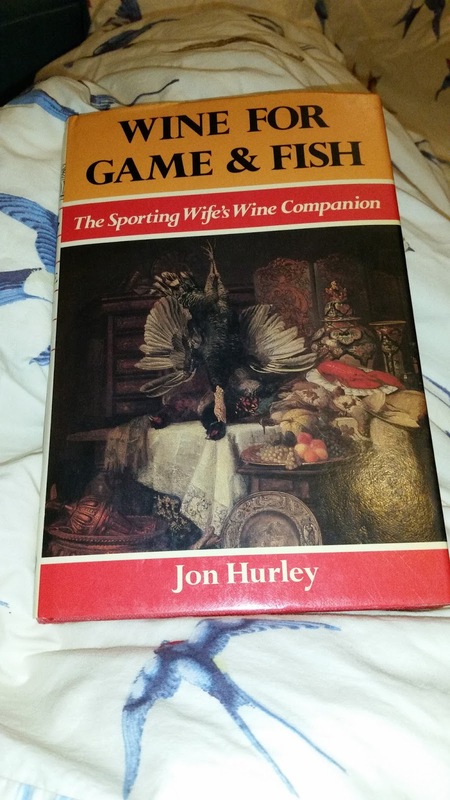 I saw 'Wine For Game & Fish; The Sporting Wife's Wine Companion' mentioned by Fiona Beckett (if you want a food and wine match she's the first place you should look) the other day and was intrigued by the title. A few moments research revealed plenty of cheap copies available from Amazon market place so I ordered one and it arrived today. Food and wine matching is theoretically a large part of my job. In practice it doesn't happen enough - for all sorts of reasons. Which is a shame because it's one of the more enjoyable things I get to do at work, and also because I truly believe it's something worth thinking about. If you're having wine with food they'll be more than the sum of their parts if they work well together, both will suffer if they don't. It's also coming round to the time of year when there's plenty of game in season and most of it's cheap. I might not have The Sporting Wife's game cookbook (though it would be worth looking out for based in the recipes that Jon Hurley is matching wines too) but I do have plenty of other game cookbooks for inspiration and a good market not 10 minutes walk away (will this be the year I finally cook pigeons?). I want to do anything I cook justice, or at the very least have something decent to wash away the taste if it's an abject failure. Having just spent a happy couple of hours with Mr Hurley I can confirm that the investment was worth while. He has very sound advice about wine generally, it's been fascinating seeing what the wine world looked like in 1986, he's an amusing companion, and the recommendations are satisfyingly comprehensive. I must admit I've never been so grateful for screw caps on bottles before tonight. I've always thought they were a good thing, but after warnings about having a towel or other cloth to wrap the bottle in when opening to avoid injury in the event of a breakage, and a reminder to wipe away the cork weevil poison from under the lead or foil caps, I'm looking at them with an ever kindlier eye. Food and wine matching is both art and science. Basically there are sound scientific principles that cover the basics, but however technically correct the match if you don't actually like the wine it's going to be a waste of time. It's also sometimes about getting people to lay aside deeply held prejudices and getting them to think about a wine in a different way. I will only believe that you really don't like Chardonnay when you can convince me you've tried it in a really comprehensive range of expressions, and sweet wines are not poison (though I'm still concerned about the cork weevil revelation). Meanwhile, for all its 30 years old, this remains an excellent little book full of good advice. 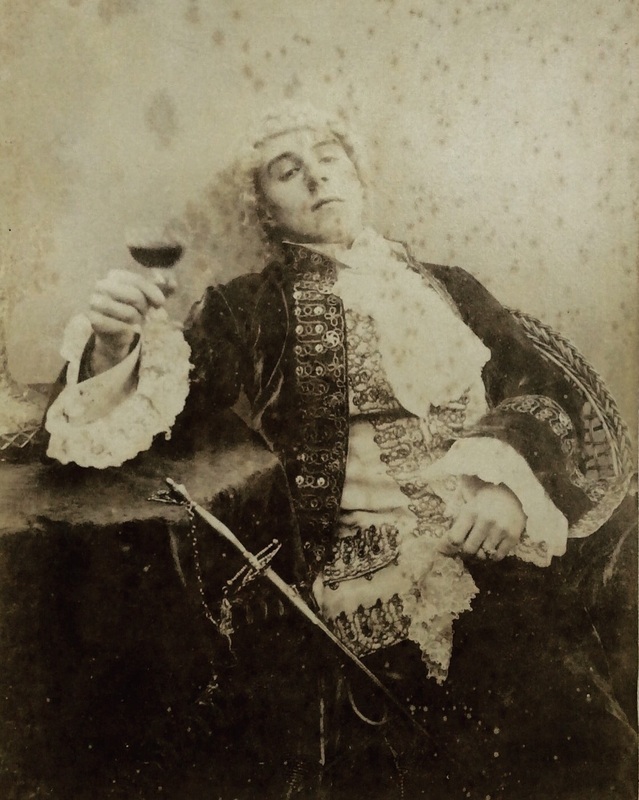 The recommendation to pick up a good solid Victorian or Edwardian wardrobe and have it fitted with shelves to make a substitute cellar seems particularly sensible (well, it does if you plan on collecting a few nice bottles), Hurley also suggests bolting it to the floor - he's right, a fallen wardrobe that's bleeding wine would not be a happy sight - and having a key for it. I'm really pleased with it, indeed pleased with it to the point of wanting to get copies for some of my wine loving friends too. It's that good. The last week has not been improved by having a cold that's turned into bronchitis (I've coughed so much it hurts to talk, I'm not very stoical about illness at the best of times, this has not been the best of times) which is leaving me feeling so tired that my head might as well be filled with cotton wool for all the powers of concentration I seem to be able to commend at the moment. I've been trailing into work with the generally sunny demenour of a medieval martyr approaching a large bonfire - though at least I'm being left alone when I'm there (because I sound terrible and nobody wants to either hear me grumble about it, or catch it) which makes a nice change. On the up side it's been a great week for cookbooks (I've got 3 absolute peaches) and that's something to celebrate. That one of them is a new Diana Henry is even more cause for celebration. Her books are something I look forward to months in advance and now it's here I really want to just take a week off and cook from it. Actually the more I think about it the better that sounds. A week of not grabbing cereal for breakfast because I'm in a rush to get out, not making do with a sandwich for lunch because it's convenient. And of reliably being at home in time to think about cooking instead of getting in at 9pm and opting for cheese on toast a couple of times a week. 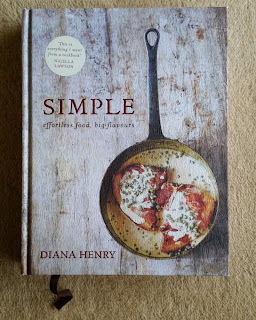 'Simple' has the tag line of 'effortless food, big flavours' which are things I associate with, and love about, Diana Henry's books. It's also the kind of cooking I most enjoy. It's not neccesarily about quick food, but food which can be prepared with the minimum of fuss. It's also a reminder that being well organised can be a big help. Keep some nice things in tins in the cupboard, have a decent selection of herbs and spices, don't forget the pulses or the pasta, and you're already half way to a proper meal. I like the toast chapter for reminding me that a slice of sourdough with something like carrot houmous with roast tomatoes and Harissa yoghurt is something to look forward to rather than the somewhat depressing cheese on toast I've been making. Baked sweet potatoes with chorizo and eggs sound bloody marvellous for a week night supper, as do the braised leeks with peas, dill, and feta. Plenty of ideas for baked, grilled, and poached fruit make me happy too. 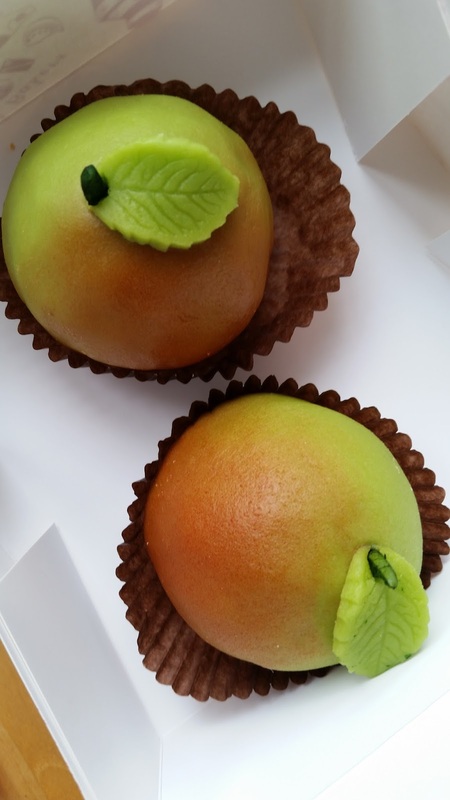 These are the things that work best with the kind of sweet wines I like (I'll need to check the apricots grilled with honey but I'm thinking they'll like a Sauternes as much as I do). Plums in sloe gin sound amazing (my mouth is watering now) and are a great reason not to get despondent about autumn (which I do). And that's the book in a nutshell. Good things that can be put together with a minimum of fuss but which still speak of care and love. 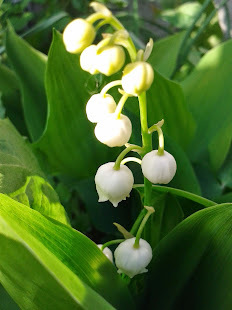 Fresh things to inspire someone (me) who's been slipping into a foodie rut and feeling to harassed to do much about it. This is just the kind of book I need to give me a shake up, it's left me feeling really excited about what I might cook next for the first time in weeks - and who can ask for more than that? This is the second book from the Shetland Guild of Spinners, Knitters, Weavers and Dyers, and the first think to say about it is this: keep them coming ladies. 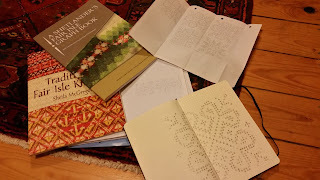 The first one was A Legacy of Shetland Lace which is a tremendous book for anyone with even the faintest interest in knitting or the history and culture of Shetland. 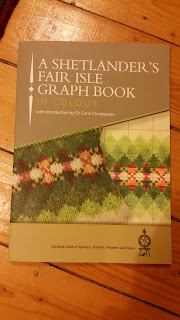 'A Shetlander's Fair Isle Graph Book' is a somewhat different proposition, basically it's a facsimile of 2 original graph books of patterns with slightly obscure beginnings. Guild member Kathleen Anderson had been given them some years earlier by the son of the knitwear manager for Anderson & Co. As someone who primarily knitted lace she hadn't given them much attention until the guild started talking about producing a book on Fair Isle. 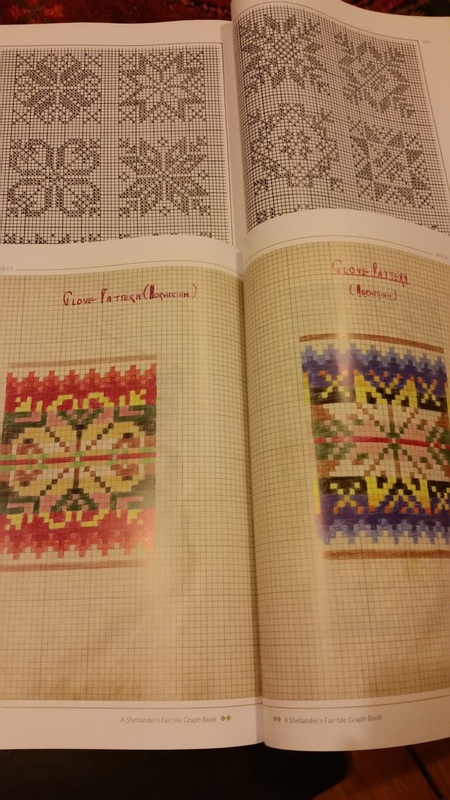 When the guild as a whole got a look at the books with a view to incorporating some of the patterns into the original Fair Isle project it seems the decision was quickly taken that they deserved their own book. 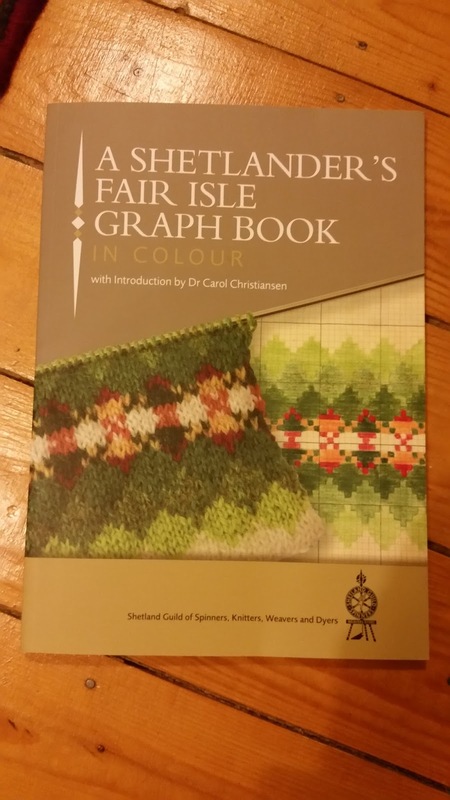 The preface promises that a collection of guild members Fair Isle patterns is still in the pipeline - which is something to look forward to, but meanwhile this book is a treasure. it's also something quite unique. Unlike Shetland lace patterns - which if they were recorded, were recorded in the briefest of written abbreviations - charted collections of Fair Isle patterns have been around for quite a while, but generally they're in black and white giving no clue to what the garments might have looked like. These graph books are in full, glorious, colour. They date primarily from the 1930's and 40's and had belonged to Bill Henry who was in charge of hosiery at Anderson and Co in the mid 20th century. It's not clear if he collected the patterns himself, but they would have reflected the kind of Fair Isle knitting the company bought from self employed knitters. Nor is it clear what they were used for, its possible that they were intended as specific instructions for knitters (though in that case knitted samplers, which were commonly used, would seem more practical). It's also possible that the books were a record of interesting patterns or colour ways that passed through Anderson & Co, or simply a creative exercise. To me they look like someone's working notebooks, somewhere to try out ideas before committing them to wool. 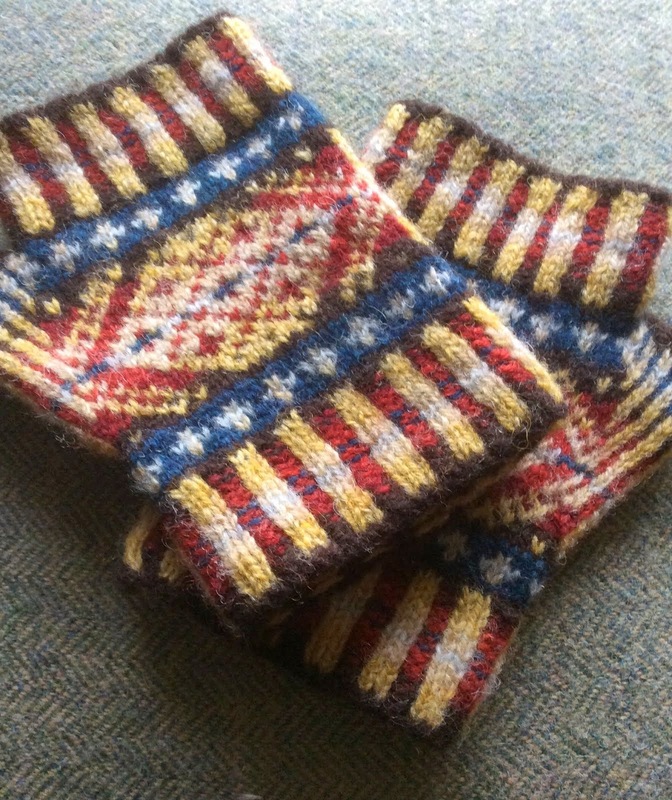 The great thing about Fair Isle, (or stranded colour work if you prefer) is that at its most basic level it's quite easy. The basic level is rows of small patterns where the maths remains simple. As the patterns get bigger and more intricate so does the maths to make everything hang together, but it's nothing a bit of forward planning can't deal with. What I have found complicated is working out how to use colour, and I'm not alone in this. It's always fascinating when designers like Kate Davies, Donna Smith, and Ella Gordon (chosen because I read their blogs, it could, and should, be a much longer list) share the thought process behind their colour choices, it's also really helpful. I had thought colour would be something I would find easy. My artistic education might have been patchy but between an A level in art, and a degree in history of art, I have a fairly comprehensive grasp of colour theories, and I'd always been quite confident in the colour palates that appeal to me. It went for nothing. Seeing the patterns here is a revelation. There are traditional combinations of colours which would have been available with natural dyes, and straight off the sheep, but as by the 1930's pre dyed wool in all manner of colours was cheaply available there are some eye popping combinations here which are really going to give me something to think about next time I look at a vintage black and white photo. The Norwegian star motifs are particularly interesting in this respect, they are devices which would probably have been familiar to Shetland knitters long before WWII, but the influx of Norwegian sailors during this time really boosted their popularity. The versions recorded here are - well they're stunning, and far more colourful than I would have imagined. Dr Carol Christianson's introduction is excellent for putting the graph books into context, and holding this book I feel like I've got something really significant in my hands. As a design source book it's a lovely thing to have, and one which is certainly going to encourage me to be bolder with some of my colour choices. It's also really helpful as a guide for how to put patterns together. But it's more than just a source book, it's also an incredibly vivid historical document which gives an insight into how one small part of the past might have looked. I hope I'm managing to express just how exciting I find that! 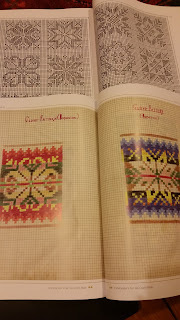 It's also further convinced me that there's a real need for a comprehensive illustrated collection of historical Fair Isle colour ways and patterns - please, somebody, take on that project! 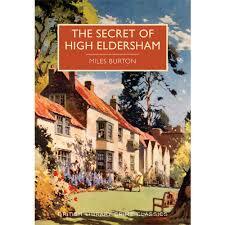 'The Secret of High Eldersham' took me back to 1930 and was another book that was an absolute blast to read. I feel like I should be mixing it up a bit, and to that end have been carrying around some very sensible looking books for the last couple of weeks, but I'm not quite in the mood for them. And then I have such an inviting pile of classic crime to get through, and found some splendid looking vintage thrillers in The Works, so maybe I should just give in and go on with the crime (reading) spree. The secret, or at least one of the secrets, of High Eldersham involves a satanic cult - which is a device I love, at least in this era where the details aren't too explicit and the atmosphere tends towards melodrama. Satanism that looks like it wants to be taken seriously is a different matter. In this case it's mostly a matter of window dressing, and red herrings used to provide a splendidly creepy atmosphere and distract us from what's really going on. After reading 'The Case of The Missing Brontë' I've also been considering the feasibility of such a cult existing. In the Brontë case it was just about possible to imagine that a lost manuscript could come to light roughly 130 years after it was written, all it elites is an old house, an attic, and some dusty trunks - I've found things that kind of age myself (though nothing more interesting than newspaper clipping, old photos, and the like). 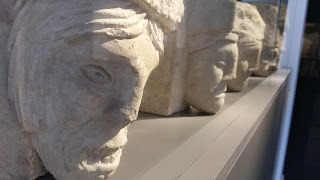 Similarly it's easy to imagine that in 1930 it would just be possible in a particularly remote corner of East Anglia there would have been enough remnants of old folk lore and memory to make some rather strange goings on quite feasible (if unlikely). In tune with the strange goings on 'The Secret of High Eldersham' is more thriller than whodunnit. Samuel Whitehead is a retired policeman who's taken over the Rose and Crown pub just outside the village. He's been there a couple of years and seems well enough liked - until he's found stabbed to death one night. Scotland Yard is called in but doesn't feel like it's getting anywhere, so in turn requests the unofficial help of one Desmond Merrion, ex of the secret service. From here on in things get increasingly exciting and the murder takes something of a back seat. The conclusion, as it finally unwinds, brings all the elements back together and is thoroughly satisfying, it's everything that's good about this series - books that are big on atmosphere and entertainment as well as being full of interesting period detail. Reading this was a simple, rather than a guilty, pleasure - and one I highly recommend. 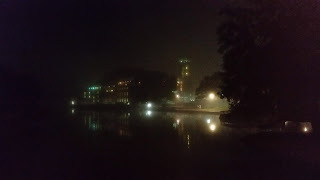 Last night was (what I think is) our last visit to Stratford and the RSC for this year. We went to see Aphra Behn's 'The Rover', partly out of a sense of guilt that none of us actually knew anything about her, or her work, despite it falling within the remit of things all 3 of us are interested in. Aphra Behn - playwright, poet, spy, translator of science, novelist, Tory, political propagandist, royalist, and first English woman to make a living out of her writing. It's quite a CV for anyone, that it's for a woman born in 1640, and who died in 1689 is something to think about. She seems to have been both ahead of her and very much of it - certainly the Restoration period seems to have been the sort of society where such a woman could flourish. the reason I haven't ever really explored her work before is that 'Oroonoka', the novel I've seen in book shops most often (though not available in Leicester today - I looked) never appealed to me as something to read for pleasure. I can't deny that it looks like something I should have read - but that's a long list. 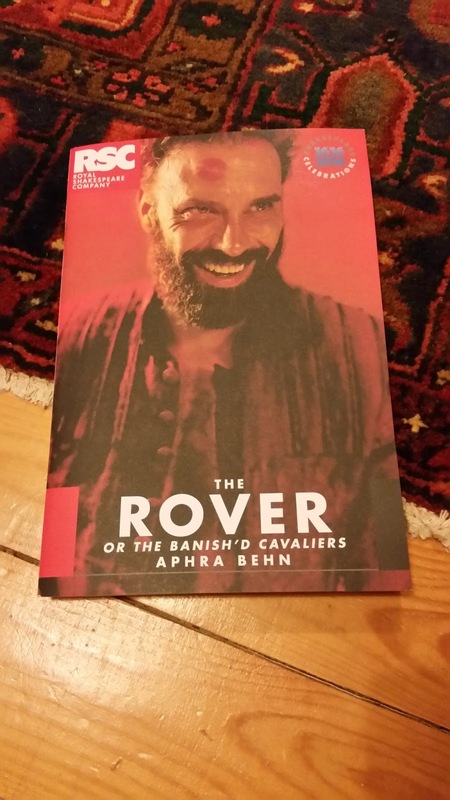 'The Rover' is far more appealing. 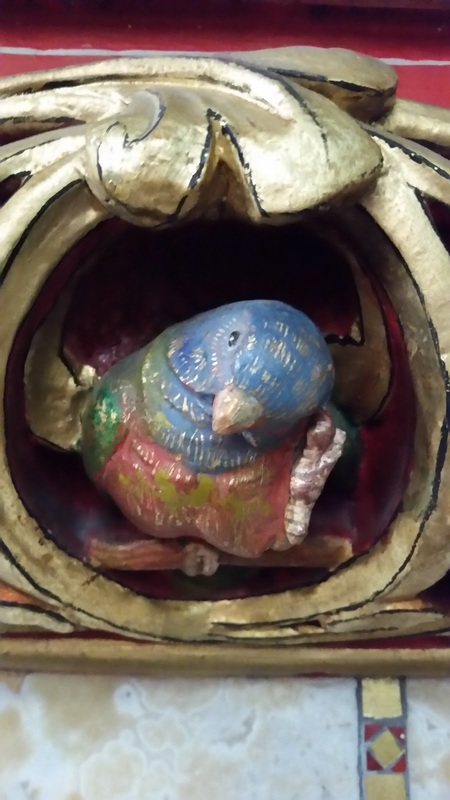 During the exile of Charles II a band of cavaliers including Colonel Belvile and Captain Willmore (possibly based on the Earl of Rochester who's family name was Wilmot) find themselves in a foreign country at carnival time. Belvile is in love with Florinda who's father and brother both have different, but equally unwelcome husbands in mind for her. Florinda wants Belvile. Her sister, Hellena (played by the very good Faye Castelow) is destined for a convent, but has other ideas. That other idea turns out to be Willmore, the rover, who is happy enough to oblige. He's also happy to oblige the famous courtesan Angellica Bianca, and when he stumbles across Florinda she narrowly avoids being obliged too. Angellica, who for the first time has taken a lover rather than a patron, objects. With a gun. The much younger Hellena minds less - she'll take Willmore as he is, but then he does represent freedom, and what's fidelity compared to that? And it's all set against the anarchic energy of the carnival when just about anything could happen. It was good to be back in The Swan, I love that theatre - not to big, not to small, and I've never been disappointed by anything I've seen there. I'm also increasingly of the opinion that you can't go wrong with a restoration comedy (I'm assuming the duff ones have no chances of being revived). This one was as witty, energetic, bawdy, and subversive as we could have hoped for. I was about to start on how much 'The Rover' makes of the double standards applied to women, but on reflection I'll leave that until (if) I get round to reading the script. It was an interesting play which provided plenty to think about, but mostly what I came out thinking about was how much fun it was. Before the play even starts there's music and dancing to set the carnival mood, there is no fourth wall, the set and costumes were perfect (minimal set, gorgeous costumes made up of a clever mix of modern and period clothes) and excellent all round performances. Joseph Millson as Willmore has the lions share of work to do, and did it with panache. He was both convincing, and very funny, as an unrepentant libertine with more than enough charm to be forgiven for his philandering. Gyuri Sarossy was brilliant as Don Pedro too, he certainly got the best underwear. But it was all excellent, honestly, go and see it! I'd been eyeing up the Pan reprints of the Robert Barnard books when Harriet Devine and Elaine at Random Jottings both said good things about him - so I promptly bought them, and after only a few months (which all things considered is still quite prompt) read them. The first thing I feel I have to say about 'The Case of the Missing Brontë' is that the cover is lovely, and clearly designed to appeal to people with a penchant for vintage crime (people like me) but I'm not sure it's entirely representative of a book written and set in the 1980's. I'm mentioning it because (for no very good reason) I've spent quite a lot of time trying to imagine what a contemporary take on a 1980's book cover should look like - I still have no idea. The second thing to say is that every good thing I'd heard about this book was bang on the money. I loved it. So much so that I've had a mini Barnard binge. Briefly, Superintendant Perry Trethowan is returning to London with his wife and child after a family visit in Northumberland. When the car breaks down in Yorkshire they find themselves put up in a B&B and taking refuge in the village pub - where they meet Miss Edith Wing, she has a very interesting manuscript in her possession. One which just could be a lost second novel by Emily Brontë. The third thing I want to say about this book is how interesting I find the way it's aged. Written around 1983 this is a Britain I sort of remember - I would have been about 10 - the cultural references are familiar, the humour reminds me of Blackadder and Not the Nine O'Clock News. It's old enough to have a faint patina of nostalgia, and it also shows me (again) that I much prefer a book that's had time to settle - or to rise back to the top (like cream in milk) if that makes more sense. 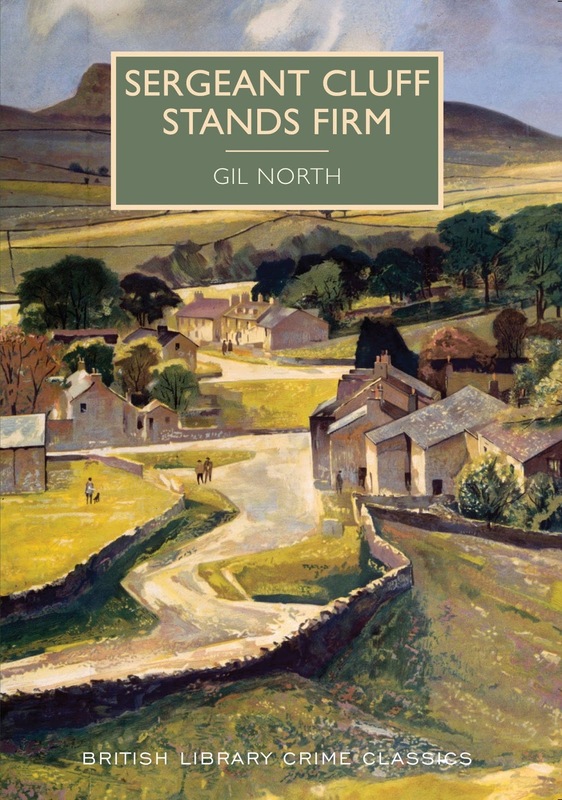 What made this one particularly irresistible, apart from the Brontë connection (which is appealing) is the glimpses of the Trethowan family - they're a cross between the Mitfords and the Sitwells with added eccentricity. It's gloriously silly in places, and very funny, but with a thread of threatened, and actual, violence that seems very much a part of an era of miners strikes and IRA bombings and which very effectively grounds the plot in a slightly uncomfortable reality. Basically it was a total treat. Trashy books and guilty pleasures. 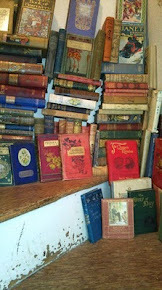 A week or so ago I followed a link from somewhere to an article about our attitude to certain books and why we happily dismiss things we enjoy as trashy. I'm rubbish at bookmarking things so can't remember where I saw the article, who it was by, or even all the points it made, but it did make me think. Guilty pleasure is a term I have a bit of a problem with, I want to think that no pleasure (as long as it's basically legal) should induce feelings of guilt, but in truth there are lots of things I do which I know I probably shouldn't and don't want others to know about. These include, but are not limited to, a liking for take away fried chicken wings (and not even with the excuse of having been drinking), eating giant chocolate buttons with tea so they melt in my mouth (best done in total privacy, and not with the lapsang souchong or Russian caravan tea I drink when people are watching), a love of super hero films (I'm a grown woman for heavens sake), and occasionally binge reading Mills & Boon. It's taken me 3 days of thinking about it to be willing to admit to any of those things in a reasonably public forum, not because any of them are particularly terrible, but because non of them feel like things I should be doing (fried chicken is not healthy, and they're certainly not organically reared high welfare standard birds - and so on) and obviously that's part of the pleasure. Also, no guilt would probably mean no self control whatsoever and that's not good. The one that I've really been thinking about though is the book question. The article (if anybody can identify it please tell me - it was probably in The Guardian, but might not have been...) questioned why we were so ready to dismiss as trash books we clearly enjoy, and suggested that we stop doing it. Trash invariably refers to genre fiction of one sort or another, and nothing is considered trashier than romance. I picked up the Mills & Boon habit from my grandmother, she devoured them by the carrier bag full from the market, inevitably I ended up reading piles of them too. And around this time of year, which I find difficult (I really dislike the beginning of autumn, winter I'm fine with) I find I crave those books. The reason I'm not overly keen to take any sort of pride in this, or reclaim it in any way, has nothing to do with the literary merit (or otherwise) of these books, and everything to do with why I read them. Everything else I read, including all sorts of (now vaguely respectable) pulp type fiction, is about engaging with the world, exploring ideas, understanding past attitudes - all sorts of things, but all of them outward looking. With M&B books it's the opposite, they're about not thinking, about shutting everything out for an hour or two, and generally retreating. I'm not sure if that's a good or bad thing. I am sure after writing this that they will, for me, remain a guilty, trashy, and essentially a secretive pleasure, in times of stress - and are all the better for it. When not thinking about, writing about, or even occasionally drinking, gin over the last month I did manage a bit of reading - though some of it seems a long time ago now. So before I forget any more details here are my thoughts on 'Sergeant Cluff Stands Firm', a treat from the British Library crime classics series. This is the first in the Cluff series, and the one I should have started with instead of inadvertently taking 'The Methods of Sergeant Cluff on holiday with me instead (I wrote about it Here). At the time I was struck by how Noir-ish the general tone was and I found the same thing in 'Sergeant Cluff Stands Firm'. So for example the hero is the strong silent loner type who is barely tolerated by his immediate superior (Yorkshire touch, he lives in a cottage with a cat and a dog). The scene opens on a dark and windswept night (Yorkshire touch - it's a dark and stormy night...). There are women at the heart of this drama, both the victim - apparently a suicide, the older wife with money of her own married to a no good waster (Yorkshire touch, it's not a lot of money and they live in a 2 bed terrace), and the mysterious blonde in a photo the husband has (Yorkshire touch - she may be wearing a cardigan and wrinkled stockings when we finally meet her.) And so it goes on. 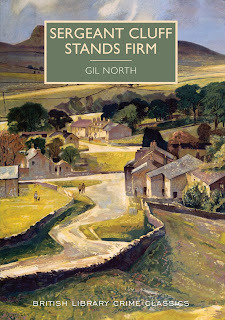 The scene is unmistakably Yorkshire, from talk of mills to walks on the moor, but the tone could be straight out of something by Vera Caspary or Sherwood King - and I loved that about this book. I assume that writing in the late fifties (this was published in 1960) that Gil North (or Geoffrey Horne if you prefer) was deliberately referencing the genre, and maybe sometimes having fun with it - though there's nothing at all tongue in cheek about the tone here. What we get is actually quite shocking. The dead woman, Amy Snowden, seems to have had plenty of leisure to repent after marrying in haste, until finally she turns a gas tap on and goes to bed. It looks like a clear case of suicide (still a criminal offence at the time) but Cluff is dissatisfied, he doesn't like the husband and makes that fact clear. His investigation technique leans heavily towards intimidation at times, albeit of the silently but obviously watching sort, and sets in motion an absolutely terrifying train of events. The other thing I loved about this book was how visual it is. I believe it was filmed as a series and I'd love to see it just to see if it looks the way I'm imagining it should. It's all the hanging around under lamp posts, striding across rugged moorland, and tramping the streets of Gunnershaw that make it come to life in my imagination - I can see it as I read, and it's all very satisfying.